Well, it was bound to happen again I guess. I’m speaking of another close call with a deer on my chilly ride to work this morning. Almost a year to the day I wrote about how a deer stepped out of the ditch and stopped suddenly before crossing (read; “Motorcycle Crossing”) as I was rounding the first curve in Skiddy on my way to work. Close enough to touch (or so it seemed) I remained calm and continued on. What this deer did after I passed is unknown, but I’m sure she was thinking those damn motorcycles are dangerous to her health. I don’t know if we motorcyclists are just oblivious to the dangers of riding or if it’s the acceptance of those dangers that keeps us riding. Surely a close call, and I mean close call, with any deer or car would stop me from riding a bike. But close calls are a part of riding and quite frankly, the deer reminded me of this. I’m not saying it didn’t startle me. But at that exact moment when I came around the corner and saw her standing there on the road, several things went through my head in a very short amount of time. But not once did I think I was going down. Chop the throttle? Apply the brakes? Swerve? Scream? I did none of that. In fact if you could have seen the look on my face I probably showed no emotion. Nerves of steel? Of course not, but it happened so fast there was little time for panic. I can’t speak for the deer. I don’t spend a lot of time thinking about how risky motorcycling can be. If I thought about it like that it would take the fun right out of riding. When something like this happens, (fewer times with deer, more often with cars) it shows me I’m living in the moment – and this moment only took about a half a second. Once it’s over, it’s down the road until the next close call happens. Not if, but when. I’m not sure if this was the same deer or not, but they were both wearing similar fur coats. It did happen in the exact same place as before and if she is anything like me we’re both creatures of habit. As long as her and her friends make a habit of staying out of my way, I’ll do my best not to hit her and ruining both of our mornings. So after I passed her and proceeded to work I realized how close this close call was. A second either way could have yielded different results and I thought to myself how many times in our lives do we have these encounters and don’t even realize it. Whether we ride motorcycles or not, life is full of “a second either way.” So why worry? I ride for that feeling of complete vulnerability to my surroundings. If this deer and I had met any other way (read collision) I might think otherwise. But part of the experience of riding is being on the edge of out-of-control with a few obstacles thrown in for good measure. So here’s to our anniversary and I hope we don’t meet again. Yes to all of this. Loved everything about this post. It’s for the love of riding. To feel alive. Living in the moment. If we focused on the risks, we’d be afraid of everything! Not just motorcycling. I enjoy your posts as well… Hopefully the weather near you is allowing you to ride (a little)! 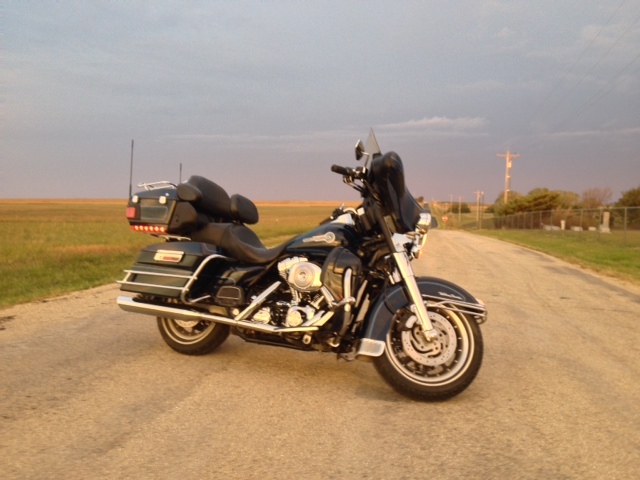 Here in Kansas I’ve squeaked out a ride every so often the last few weeks. Be safe in your travels! We have plans to get out and ride this weekend! I’m not so much interested in the 19 degree weather that we have right now though. 🙂 happy thanksgiving to you. It’s a little frosty here right now, but I’m fortunate to ride to work whenever I want, and it looks like Friday and Saturday are keepers! Have fun and happy thanksgiving to you as well.